R2010, Patrick O'Connor. Sdlg. 06-25. 36", EM. Falls white with very pale overlay of pink. Standards near white with some very pale pink toward edges. Styles cream with deeper, fleshy pink in alongside a lighter midrib. Signals are a loosely defined series of yellow lines, darker toward the middle; a few yellow lines repeated on standards. Slightly ruffled petals. Honey Star x Nottoway. The amount of pink coloring seems variable with the season; in 2009 it was near white but it has been more distinctly pink before. 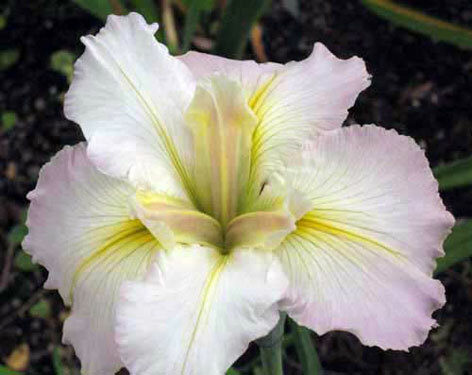 Growers in some areas of the country also have reported that the iris appears essentially white.